"This cannot be my destiny!" The above info came from Mike Liotta, and was edited by yours truly (contact me). The image came from Amada Taylor. 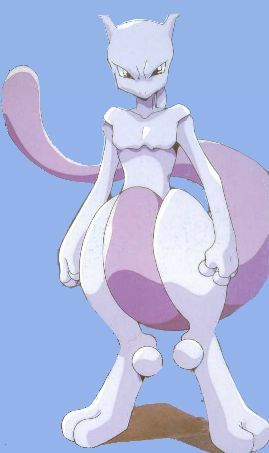 Mewtwo was created on an island in the Cinnabar Ocean by scientists who worked for Giovanni, the evil leader of team rocket and the Viridian city gym. For years the scientists struggled to successfully clone a Pokemon, without success. Each time, the Pokemon would die. That is, until Mewtwo. And although Mewtwo was the only one that survived, the scientists live to regret it, as Mewtwo destroyed them out of anger after being forced to bascially be Giovanni's slave. Mewtwo didn't stop there, though, as he vowed to destroy the entire human race. Only Mew and Ash were able to stop Mewtwo's wrath upon the world. Luckily, they were able to teach Mewtwo that humans and Pokemon could be friends, and more than just friends, they could be family. Mewtwo has made a few appearances on the T.V. show (four times in Kanto as Mech-Mewtwo, and one in Johto), and also starred as a main character in two movies. Mewtwo also came back in the movie Mewtwo Returns. Mewtwo and the other cloned pokemon find a new home on Quena in the Johto region to find peace and safety, but Giovanni finds the location and tries to put Mewtwo under his control. This time by force. Ash and his friends save Mewtwo and the clones with the help of insect pokemon and the healing spring that was there. Mewtwo frees the cloned pokemon and only erases the memories of Team Rocket and Giovanni. In some of the movies, you see Mewtwo in the end on a building with the narrater saying, "In a faraway city people sometimes see a mysterious pokemon, who wanders by moonlight..." Mewtwo makes some cameo appearances in the movies in a wanderers' cloak jumping from rooftop to rooftop. In the movie, Jessie, James, and Meowth are watching a video where a scientist tells that one year ago, they had found an eyelash of Mew from which they created a clone. However, we don't know how long after they found the eyelash that there were able to successfully create Mewtwo. We also don't know how long after that video was recorded that it is being watched by Jessie, James, and Meowth. The above description came from Mike Liotta, and was edited by yours truly (contact me). In a later movie, Mewtwo moves to the Johto region with his cloned Pokemon, seeking refuge in a secret lake high in the mountains that is said to have magical powers. Giovanni has been monitoring Mewtwo, wanting both to capture the Pokemon and seek his revenge. Team Rocket attacks the secret lake where Mewtwo is hiding, and kidnaps all his clones. Mewtwo, outraged, confronts Giovanni one-on-one. Giovanni wants Mewtwo to submit to him, but Mewtwo says he will submit when Giovanni can make him. Giovanni sends two machines to attack Mewtwo with beams of energy, claiming that machines cannot be effected by Mewtwo's psychic powers. Mewtwo pushed them back with ease, but then Giovanni captured Mewtwo's clones and said that Mewtwo should submit if he didn't want his clones to perish. So Mewtwo submits and walks into the machine so Giovanni can bend Mewtwo's will to his. After hours of pain, Mewtwo discovers that the clones would be killed by experimentation, so he breaks out of the machine. But it hurts him. It is at this point that Ash and company intervene on Mewtwo's behalf. Fighting back Giovanni, Ash takes Mewtwo to the lake, and drops him in, the lake's healing powers taking effect. Mewtwo emerges as powerful as ever, and uses his powers once again. The lake, Ash and company, and all the clones vanish. Giovanni's memories are wiped clean of any memories of Mewtwo, preventing him from seeking the Pokemon again. Mewtwo moves the lake underground, and tells Ash that the lake can no longer be accessed by normal means. Ash, happy that Mewtwo can live peacefully once again, leaves. Mewtwo, confident Ash will not reveal his secret, lets him keep his memories. The above description came from Adam Culp, and was edited by yours truly (contact me). As far as I my knowledge of Pokemon goes, there is no official record of Mewtwo's age. However, there are some hints. In the first (uncut) ten minutes of the first Pokemon movie, he is shown as a child, and later over a NON-SPECIFIED period of time physically maturing into an adult. Now, the lead scientist who created him was shown in both of these sections, yet when Mewtwo actually broke out of the tank, the scientist did not appear to have aged at all since Mewtwo was a child. Many people start counting the age of a person from the moment they're out of their mother. Some people think a person is born at the moment of conception. Mewtwo's case is vastly different, because physically he was an adult when he broke out of his tank. For all we know, he could have been conceived within the machine itself and not actually expelled from it into the tank until he was a child. The people in the Pokemon business never actually confirmed this, as far as my knowledge goes. The above description came from apparition64, and was edited by yours truly (contact me).